@schana can you prepare everything for the surveys to go live on Thursday in 13:00-14:00 UTC SWAT time and stop after 18:00-19:00 UTC the same day? Please take a note of exact start and end time of the test in the task description. @leila We still need the name parameter. 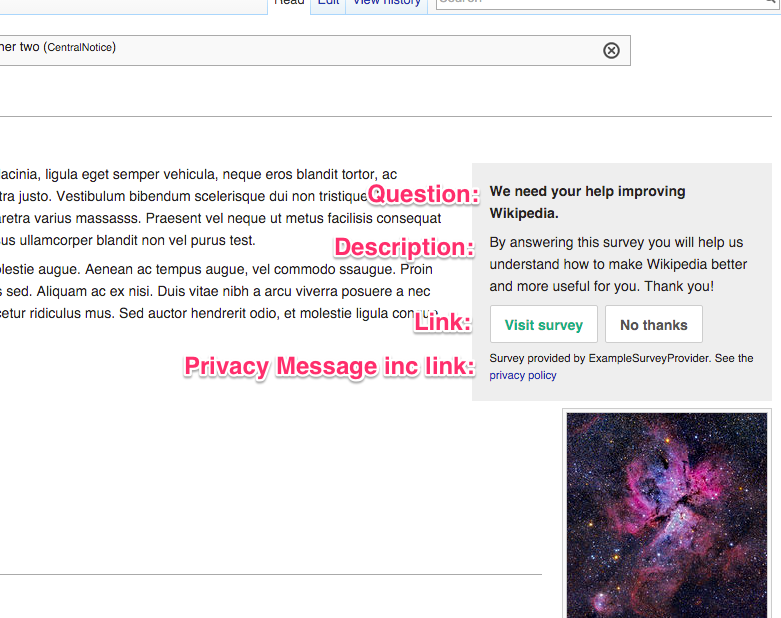 @leila https://ja.wikipedia.org/wiki/MediaWiki:Reader-segmentation-3-privacy seems to be in English - is this intentional? Thanks for checking this. I've asked Whym to help us with it and hopefully this will happen before the survey is launched tomorrow. @leila Is the translation of https://ja.wikipedia.org/wiki/MediaWiki:Reader-segmentation-3-privacy still needed? I would need to know how it is used, though. Is it a popup message or something? Any text next to this? One translation would be "アンケートのデータは第三者によって取り扱われます。[https://ja.wikipedia.org/wiki/MediaWiki:Reader-segmentation-3-privacy プライバシーについてはこちら]。" which works in most contexts, but maybe too long. 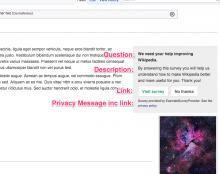 Stashbot mentioned this in T164769: Test reader survey in multiple languages - Romanian. The surveys were deployed at 1310 UTC. The first impression for jawiki was at 1312 UTC. • schana removed a project: Patch-For-Review. The surveys were disabled at 1820 UTC. The impressions mostly stopped after 1830 UTC.